“Kata” is the true essence of Karate-do. Under the point of view of an observer without any knowledge of the art, the “kata” could be described as a series of defences and attacks against imaginary enemies. Under a physical point of view, the “kata” is put together by joining techniques in movement (step by step). 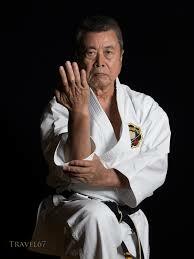 One of the main objectives of a karate practitioner is to perform all of the “kata” with the greatest perfection. The student will repeat the linked movements many times throughout the classes putting great emphasis on all details. After this aspect is controlled the objective is to concentrate on the development of “hara”: the source of energy that feeds the movements must come from the lower stomach area surrounding the centre of gravity of the body. To grasp this aspect, we start by developing what we could call a “physical hara”. Gradually, with practice, this “hara” will develop and become unconscious. The practitioner must develop a great sensitivity and concentration with the objective of perceiving each step and each movement as coming from the deepest of his being. “Kata” is one of the most effective tools to perceive the flow of our energy (“ki”): coming from our physical centre of gravity (“hara”) it flows through our whole being. The concepts of mind and body disappear, both work together. When practicing “kata” in these conditions, with time we will perceive a sensation of fluidity in such a way that the mind, the body and the technique become one (“shin-gi-tai-ichinyo). At this point we might have the possibility of considering “shugyu”: the “kata” will come from “ku” (the absolute, emptiness). We will not be aware of any technique, of the “kata”, of our mind, body or “hara”. All the energy of our being will flow through the techniques of the “kata” without being aware of it. 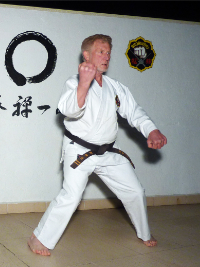 The first technique of each of the eighteen “kata” is always a movement of defence and never of attack; thus emphasis is put on a peaceful attitude (no aggression of any kind). This is a basic requirement of the practice of “karate-do” as an art. Once again O´Sensei Shoshin Nagamines expression “karate ni sente nashi” (there is no first attack in karate) confirms this aspect. Coincidence in orientation and position. 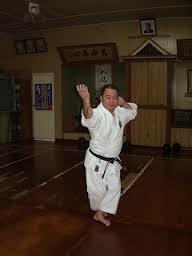 The starting point and orientation of the practitioner before performing a “kata” must coincide after completing it. All “kata” include movements of defence, attack and intermediary which are interlinked by the practitioner as if they were virtually joined with each other. Each “kata” has at least one “kiai” (outburst of total concentrated energy) which is originated in the “hara” and is liberated together with a technique.